This document covers the entire aspect of protection of the software from being misused by the buyer and to understand that the user license is for limited purposes and any infringement of the licensing terms may land the buyer in legal troubles. This document covers the entire aspect of protection of the software from being misused by the buyer and to understand that the user license is for limited purposes and any infringement of the licensing terms may land the buyer in trouble. If you are selling the software online through the Internet, you only have to design your ordering system in such a way that the buyer has to tick a box prior to ordering, to confirm that he has read these terms and conditions. 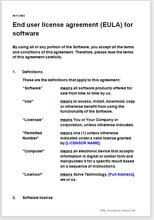 If you are selling the software on a tangible media, get the buyer to read and sign these terms on a paper while duly identifying the customer. Standard set of non-negotiable “terms and conditions”. Complete framework to protect your business from litigation and engage in one where the infringement is despite such agreement.